Oaxaca's people's movement has garnered widespread support throughout Mexico and the world, but the Mexican government has been preparing for a brutal takeover of the city. The thirteenth person that the ruling PRI-affiliated attackers kill is an independent, activist journalist from the United States, Brad Will of Indymedia. 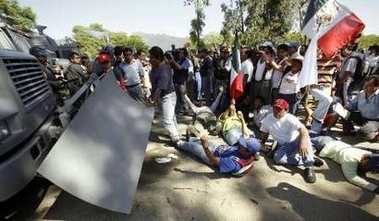 Days later, the Mexican federal government sends militarized police into the state. They do not go after the murderers, but instead use tanks and force to try to dislodge the nonviolent social movements from the city of Oaxaca. 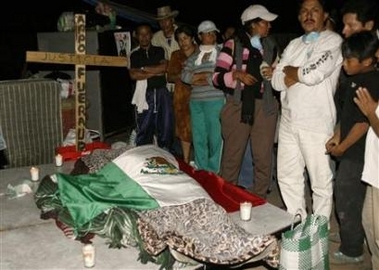 At least one boy is killed by a federal police tear-gas canister. The people of Oaxaca still hold the zocalo, the city's public space. What's the box in your living room telling you, if anything? Do you believe the story sold to you in the newspapers, that this is some sort of evenly-divided internal conflict - does that really ring true, as the struggle continues despite the weight of government against the protesters? - rather than a vast movement of the dispossessed against corrupt and uncaring government? Reporting on the Drug War & Democracy from Latin America since 2000, the Narco News Bulletin has been reporting from Oaxaca since long before the teacher's strike began, let alone became a revolution. The U.S. newspapers simply have not had people there, yet they consistently report authoritatively, and always in ways that reinforce entrenched power and exclude the perspective of the powerless. A message from Cindy Sheehan: We hope that there are enough Americans who are willing to stand up and be counted with us to demonstrate to BushCo and Congress, Inc. that we are tired of having our rights taken away from us faster than our bombs destroyed Babylon. We are tired of having our young people die and kill innocent people to enhance corporate America’s bottom line. We are tired of the constant drip, drip, drip of the wearing away of everything that we hold dear. I withdrew my consent to be governed by maniacs long ago. I withdraw my consent to be hauled off to Guantanamo and be stashed away for matriotically dissenting from this crime-ridden regime. Are you sick and tired of being sick and tired of the corruption and heartache? Show your discontent with us. Vote absentee so your vote will have a better chance of being counted and join Gold Star Families for Peace and other prominent peace groups and organizations in our continuing quest to end the illegal and immoral occupation of Iraq and hold our government accountable.